Over 100 people attended the public meeting to discuss the Hammersmith Flyover at the weekend, according to the organisers. The meeting, which was organised by local MP Mary Macleod, also heard from transport and local council officials. The sudden closure of the flyover before Christmas caused widespread traffic chaos over a wide area of west London but the long-term outcome for the flyover is still uncertain despite the partial re-opening. The meeting heard from Transport for London’s head of Public Affairs, David McNeill who updated residents on the reason for the initial closure and its subsequent partial reopening. “To be able to properly inspect the flyover we had to chip away at the concrete which weakens the structure” he commented. 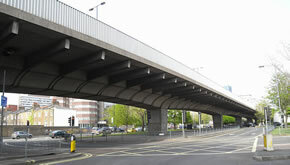 Those at the meeting heard how after a more thorough assessment of the 1960’s structure it was deemed safe to partially reopen the flyover to single lane traffic. Hammersmith and Fulham Councillor, Nick Botterill discussed some of the longer term solutions that might be considered whilst Hounslow Council Deputy Leader Ruth Cadbury commented on the affect the closure is having on minor roads in the local area. Mary added, “Whilst local residents received regular updates on the disruption, many people I spoke to expressed an interest in communicating directly with transport officials at a public meeting.